Rick began his law practice in his hometown of Pine Bluff, AR with the firm of Coleman, Gantt, Ramsay and Cox (later Ramsay Bridgforth). In the course of his thirteen years there, he had a varied practice including real estate, labor law, insurance defense, representing various banks and savings & loans, as well as a general commercial litigation practice. In 1989, Rick moved to Little Rock and joined Grobmyer, Ramsay and Ross. While there, he expanded his practice and represented several brokerage houses in defending securities related arbitrations. In 2000, Rick and other members of his firm merged with the firm now known as Eichenbaum Liles P.A. While at Eichenbaum Liles, with whom he still maintains a relationship, Rick became involved with construction litigation and continued his practice specializing in complex commercial litigation, banking and debtor/creditor matters representing both plaintiffs and defendants. Rick served as a Federal Chapter 7 Bankruptcy Trustee from 1977 until he left the panel in 2014. He has been designated an expert in bankruptcy law and debtor/creditor law. In 2010, Rick began his certification as a Mediator and Arbitrator. He has over 150 hours of training in both Arkansas and Texas, and is certified for Civil Mediation & Arbitration matters, Domestic Relations matters, and/or and Probate matters. He is has been involved in an active mediation and arbitration practice since 2011, most recently opening Ramsay Mediation & Arbitration in June of 2016. Early in his career, Rick realized the importance of “giving back” to his profession and has been extremely active in the Arkansas and American Bar Associations. 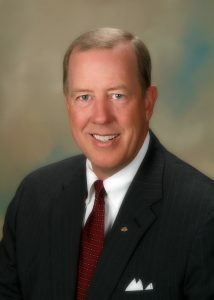 He served as Chairman of the Arkansas Young Lawyers Division in 1985, was President of the Arkansas Bar Association in 2007-08, President of the Southern Conference of Bar Presidents in 2007 and has served as the Arkansas Bar Association Representative to the House of Delegates of the American Bar Association since 2012. Rick served on the faculty of the Arkansas Professional Practicum. He is also a Fellow of the American Bar Foundation; an honorary organization of attorneys, judges, law faculty, and legal scholars who have been deemed by their peers to have demonstrated outstanding achievements and dedication to the welfare of their communities and to the highest principles of the legal profession, which limits its membership to one third of one percent of lawyers licensed to practice in each jurisdiction. Rick has been married to his wife, Clair, for 23 years and they have four children; Jimbo Ramsay, Liz Ramsay Dalton, Alex Graham and Clancy Graham Rodgers, and three granddaughters.